I've mentioned before that falafel is my favorite savory food but cheesecake is hands-down my favorite dessert. And while there's nothing quite like the beauty of a perfectly baked New York style cheesecake, topped with strawberries, there's room in my heart for all sorts of variations. In fact, my favorite version doesn't get baked at all. My mother's signature cheesecake was a version of the no-bake recipe on the back of the cream cheese label. Her twist was to make it in a square pan instead of a pie tin and use cocoa soaked butter cookies instead of graham crackers. The cookies would absorb the flavors of the cheesecake and it was pretty much the best thing on earth. These days I avoid making her recipe in an effort to keep from inhaling the entire tray by myself. But the spirit of a no-bake cheesecake lives on in many variations in my kitchen. This recipe is lighter as a result of the labneh cheese and includes the seasonal flavor of pumpkin. Combine the Greek style yogurt with the teaspoon of salt and wrap it in a piece of cheesecloth. Place the cheesecloth in a fine mesh strainer over a bowl (make sure the bottom of the strainer does not touch the bottom of the bowl) and allow to sit on the counter for an hour. Drain the liquid that forms in the bowl and place the strainer and bowl in the refrigerator to continue straining for approximately 24 hours. Drain it every few hours. The longer you strain the yogurt, the thicker your labneh cheese will be. Combine the drained labneh cheese with the sugar, milk and vanilla and set aside. Combine the unsweetened pumpkin puree with the sugar, 1 tablespoon of the labneh cheesecake filling you just made, cinnamon and pinch of salt. 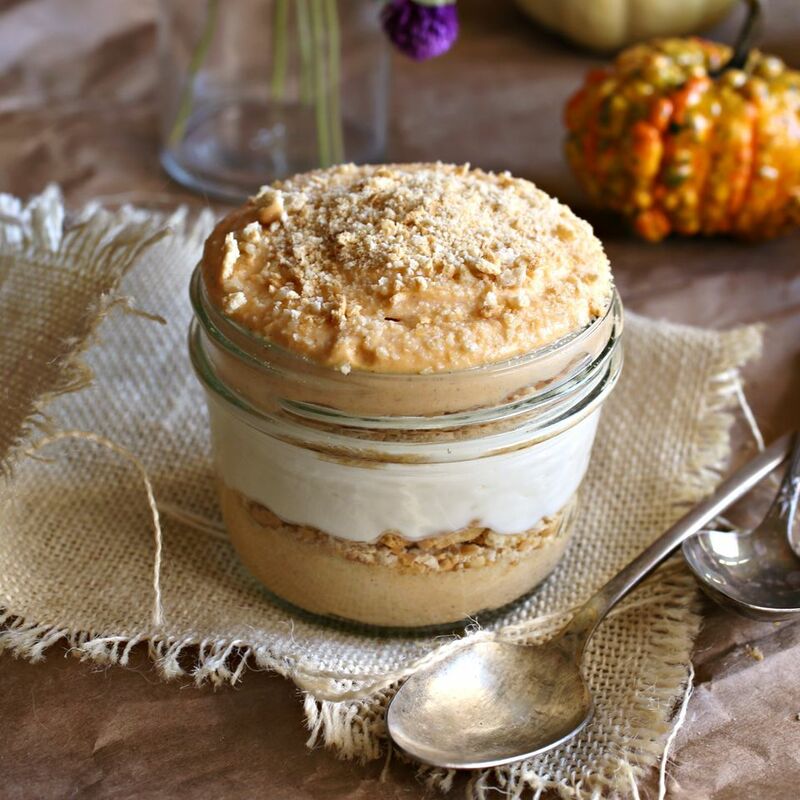 Assemble the dessert by placing a tablespoon or so of the crushed graham crackers or ginger cookies in the bottom of a jar or dessert dish. Top with a couple of tablespoons of the pumpkin filling, another layer of graham crackers, a couple of tablespoons of the labneh cheesecake filling, another layer of graham crackers and a final layer of the pumpkin mixture. Repeat with 3 other serving dishes or jars and refrigerate a little while to set.